The camera is equipped with a rechargeable lithium-ion battery and a slot for MicroSD cards (no microSD card included) and the maximum supported capacity is 16GB. 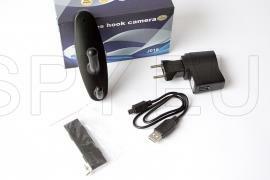 The camera can operate in two modes – manual or motion detection. The device is automatically recognized by the operating system and there is no need to install any additional drivers. The files are in resolution 720х480 and 30 frames per second. The built-in battery allows for approximately one hour and a half nonstop recording time. The camera in this hanger allows taking pictures and video fast easy by simply pressing a button on the remote control. Photos are in JPEG with resolution 2560x1440 pixels and video is AVI with 1280x720, 30 fps. With the IR diode it can record even in complete darkness. LEDs are 11 and are not visible when turned on. To record only when there is motion you can activate the motion detectors. This is done again by pressing the button on the remote. This camera can record when connected to external power and thus it's not limited by the built-in lithium-ion battery that provides about an hour of continuous recording.